Santa Barbara Seasons Editor Leslie Dinaberg, photo by Tracy Smith. Relationships and connections are endlessly fascinating, and the art of making a life together while making art is even more compelling. In our feature on creative couples and “The Art of Being Together,” photographer/writer Leela Cyd teams with six local couples who share how they collaborate, cohabitate and continue on their creative paths together. A change of scenery is always a great way to relax and recharge your energies—and your relationships. Whether you’re vacationing or stay-cationing, the Santa Ynez Valley Wine Country makes a great getaway, especially at the newly refurbished Skyview. Read all about this cool place in “Retro-Chic Revival at the Skyview Los Alamos.” Wendy Thies Sell’s guide to “10 Wonderful Winter Wine Tasting Adventures” also has some terrific recommendations for wine adventures to share with your loved ones. All of us at SEASONS wish you the happiest of holidays and an even better new year to come. Cheers to a wonderful winter! Ben Rector courtesy Kids Helping Kids. Sure, there are many, many ways to learn about philanthropy and economics, but the San Marcos High School Kids Helping Kids program has to be one of the most interesting and unique. 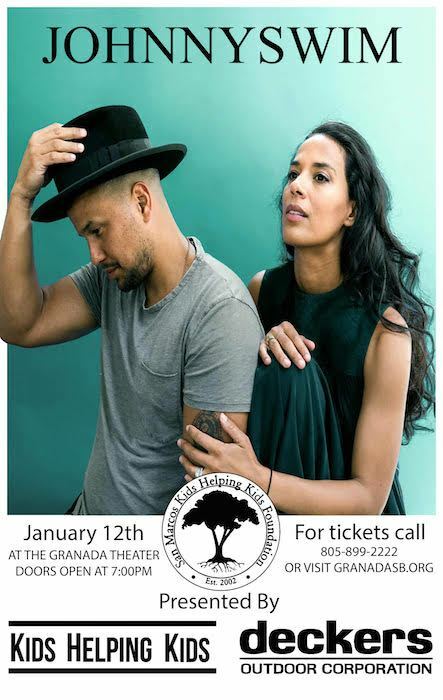 JohnnySwim courtesy Kids Helping Kids. During the course of 16 years, students have raised more than 3.1 million dollars for charitable purposes—to improve the lives of disadvantaged children both globally and locally. This year’s student-run gala benefit concerts feature Ben Rector on Friday, Jan. 11, and Johnnyswim on Saturday, Jan. 12. Both shows take place at The Granada Theatre (1214 State St., Santa Barbara). For more information, visit kidshelpingkidssb.org. One of the highlights of my year is always the Santa Barbara International Film Festival, which offers a whirlwind 11 days of more than 200 films, tributes and symposiums that range from American indie films to world cinema and everything in between. At press time, Glenn Close, Melissa McCarthy and Viggo Mortensen were set to receive awards, with many more starry tributes to be scheduled. We can’t wait to see what the organizers have in store for this 34th annual event, which takes place Jan. 30-Feb. 9 at various locations in downtown Santa Barbara. For more information and updates, visit sbiff.org. Nisse at Solvang’s Julefest, courtesy Solvangusa.com. in America,” the Danish village of Solvang truly sparkles during the annual Solvang Julefest (pronounced Yule-Fest) celebration, taking place from Dec. 1 through Jan. 4. Highlights include the Nisse Adventure Hunt, Candlelight Tours, visits with Santa “Julemanden” in Solvang Park, Shop, Mingle & Jingle Weekends and the Holiday Wine & Beer Walk “Skål Stroll!” There’s no better way to get into the holiday spirit than a visit to Solvang. For more information, visit SolvangUSA.com. World of Pinot Noir, courtesy photo. a special celebration rare library pairing dinner for the 30th anniversary of Fess Parker Winery. For more information, visit worldofpinotnoir.com. San Marcos High School Kids Helping Kids program has to be one of the most interesting and unique. During the course of 16 years, students have raised more than 3.1 million dollars for charitable purposes—to improve the lives of disadvantaged children both globally and locally. This year’s student-run gala benefit concerts feature Ben Rector on Friday, Jan. 11, and JOHNNYSWIM on Saturday, Jan. 12. Singer and songwriter, Ben Rector is most notably recognized for his smash hits such as “Drive” and “Brand New,” and he just released his sixth album, titled Magic, which debuted at No. 1 on the Billboard Americana/Folk Charts and No. 44 on the Billboard 200 chart. The Oklahoma born and Nashville based singer, songwriter, and multi-instrumentalist uncovers that feeling of “magic” within 13 anthems equally rooted in whimsical nostalgia and excitement for the future. His ceaseless touring and prolific output paid off in a big way on the 2015 breakout Brand New. Clocking 41 million-plus streams on Spotify, the single organically landed over 40 film and television placements, including a trailer for The Edge of Seventeen, a TV spot for Disney’s Moana, and MLB World Series and Olympics primetime spots. Both shows take place at The Granada Theatre (1214 State St., Santa Barbara). For more information, visit kidshelpingkidssb.org. Originally published in Santa Barbara Seasons on December 17, 2018. 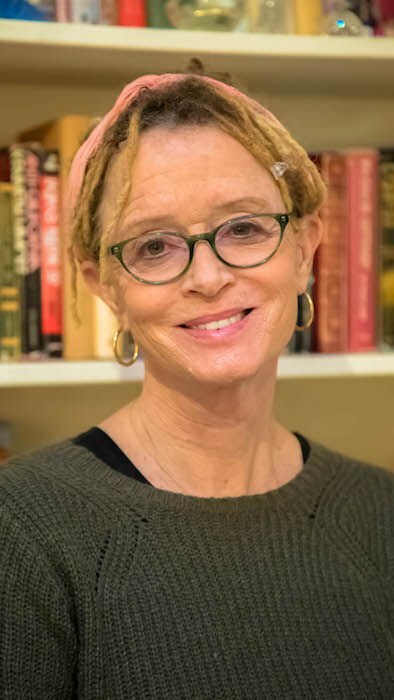 Anne Lamott, photo by Sam Lamott. Beloved author Anne Lamott is known for addressing complex subjects like addiction, motherhood, and faith with humor and uncompromising honesty. Her wise perspective has turned her books like Operating Instructions and Bird by Bird into well-worn handbooks for millions of readers who revel in her joyously messy take on life. As the New York Times described Lamott, she is, “a writer who has perfected the art of saying the unsayable.” She doesn’t try to sugarcoat the sadness, frustration and disappointment, but tells her stories with honesty, compassion and a pureness of voice. UCSB Arts & Lectures presents an evening with Anne Lamott on Tuesday, April 24, at 7:30 p.m. at The Granada Theatre, 1214 State St., Santa Barbara. An inductee of the California Hall of Fame, a Guggenheim Fellow and the subject of a documentary by Academy Award-winning filmmaker Freida Mock, Lamott ventures to explore where to find meaning in life. Her latest book Hallelujah Anyway: Rediscovering Mercy, will be available (with others) for purchase and signing. 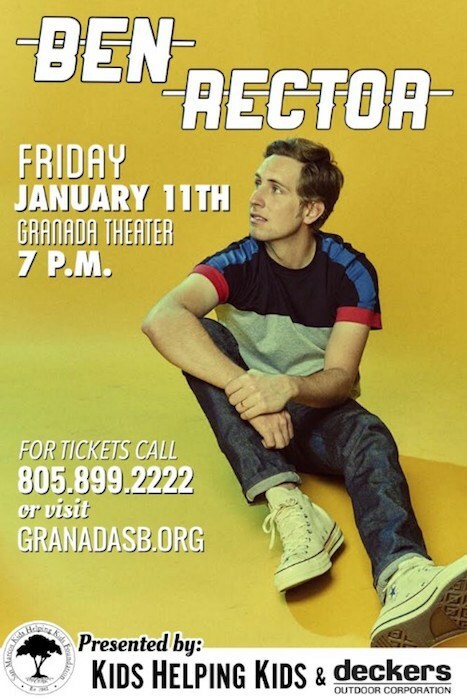 For tickets and information, call 805/893-3535, www.ArtsAndLectures.UCSB.edu or The Granada Theatre at 805/ 899-2222 or granadasb.org. Originally published in Santa Barbara Seasons on April 20, 2018. CAMA’s International Series presents Orchestra of the Age of Enlightenment on Tuesday, February 13, at 8 p.m. at The Granada Theatre, 1214 State St. The program includes: Ludwig van Beethoven: Symphony No.4 in B-flat Major, Op.60 (1806) and Beethoven: Violin Concerto in D Major, Op.61 (1806). For the past 30 years, the Orchestra of the Age of Enlightenment has shocked, changed and mesmerized the music world by reinventing the orchestra. Working with several principal artists, not just one conductor, and performing repertoire from a variety of eras on period-specific instruments, the London-based ensemble stands for excellence, diversity and exploration. It has become the toast of the European touring circuit with annual performances at London’s most prominent arts centers including the Southbank Centre, BBC Proms and Glyndebourne. Nicola Benedetti is one of the most sought after violinists of her generation. Her ability to captivate audiences with her innate musicianship and dynamic presence, coupled with her wide appeal as a high profile advocate for classical music, has made her one of the most influential classical artists of today. Originally published in Santa Barbara Seasons on February 10, 2018. Mexican-American balladeer Lila Downs, kicks off the 2017-18 UCSB Arts & Lectures season with her deeply affecting voice and dramatic performance style on Wed., Sept. 27, at 8 p.m. at The Granada Theatre. Photo by Marcela Taboada. “Few alternative artists have the dynamic power and range of this bilingual warrior-woman,” states NPR. Grammy Award-winning Mexican-American balladeer Lila Downs will kick off the 2017-18 UCSB Arts & Lectures season with her deeply affecting voice and dramatic performance style on Wed., Sept. 27, at 8 p.m. at The Granada Theatre. Known for her powerful three-octave vocal range, unique synthesis of indigenous Mesoamerican music with cumbia, soul, jazz, hip hop and stunning wardrobe based on the textiles of Mexico’s indigenous cultures, Downs’ new album, Salón, Lágrimas y Deseo, was released in May to wide critical acclaim. Originally published in Santa Barbara Seasons on September 24, 2017. Vocalosity performs at the Granada on Nov. 11. Courtesy photo. The highly anticipated a capella performance, Vocalosity, comes to The Granada Theatre on Friday, November 11, as part of the Granada Theatre Concert Series. From the artistic producer of Pitch Perfect and The Sing Off, Vocalosity takes a cappella to a whole new level with a show stopping theatrical performance featuring 10 dynamic voices singing some of today’s most popular hits. Vocalosity explores all genres of music – from tenth century Gregorian chant and classic choral, to barber shop quartet and bouncing doo-wop all the way to The Beatles and Bruno Mars. Combine that, with movement and choreography from Sean Curran (Stomp original cast member), and you have an exhilarating evening of song unlike anything you’ve ever seen or heard, live on stage! Vocalosity comes to the Granada Theatre to perform on Nov. 11, courtesy photo. The Granada Theatre recently announced that a cappella group AIRPLAY has been selected as the winner of the A Cappella Performance of a Lifetime Contest and will have the exclusive opportunity to perform as the opening act for Vocalosity‘s Santa Barbara performance. AIRPLAY originated in Santa Barbara, when founding members Antonio, Bobby, Jeff, and DJ formed UCSB’s all-male a cappella group, “Brothas from Otha Muthas” (BFOM). BFOM remained an all-male group until Jane joined after being a member of the Tritones in San Diego. Ben, also a Tritones alumni, joined soon after and AIRPLAY was born! To add even more excitement around the show, Vocalosity’s artistic producer Deke Sharon, is coming to The Granada Theatre to host a Master Class on Monday, October 24, 7 p.m. The Master Class will be open to the public—FREE for all singing enthusiasts of our community in the McCune Founders Room at The Granada Theater. Deke will be coaching the winning group, as well as other contest participants. The Granada Theatre is extending an invitation to this exclusive Master Class to all vocalists and singing enthusiasts in the community, offering a unique opportunity to learn from one of the greatest creative minds in a cappella music! This class is FREE and open to the public, no tickets required. Deke Sharon will teach a free master class at the Granada on Oct. 24, photo courtesy Vocalosity. Don’t miss the Vocalosity performance, with special guest a capella group, AIRPLAY, opening the show at The Granada Theatre on Friday, November 11, 8 p.m. Tickets maybe purchased online here http://ticketing.granadasb.org/single/PSDetail.aspx?psn=7986, or by calling The Granada Theatre Box Office at 805/899-2222. Originally published in Santa Barbara Seasons on October 21, 2016. I’ve been a fan of The Producers since my childhood friend (and Santa Barbara local) Cady Huffman originated the part of Ulla and won a Tony Award for it in 2001. This Mel Brooks hit musical is still one of the funniest shows around. Just thinking about the geriatric Old Betties dance number with their walkers is enough to make me laugh. If you haven’t seen it before, you’re in for a treat! | Feb. 16–17, 7:30 p.m. The Granada Theatre, 1214 State St. 805/899-2222, granadasb.org. There are a lot of ways to learn about philanthropy and economics, but the San Marcos High School Kids Helping Kids program has to be one of the most interesting and unique. Over the course of 11 years, students have volunteered more than 10,000 hours of work, resulting in $700,000 being raised for charitable purposes—to improve the lives of disadvantaged children both globally and locally. This year’s completely student-run annual gala benefit concert features Needtobreathe as headliner, with an opening set by Johnnyswim. | Jan. 8-9. The Granada Theatre, 1214 State St. 805/899-2222, granadasb.org, kidshelpingkidssb.org. STOMP will be at the Granada Theatre on Feb. 9. Courtesy photo. This high-energy percussive symphony of matchboxes, brooms, garbage cans, Zippo lighters and more has to be seen and experienced to be believed. The whole family is sure to enjoy the inventive and invigorating stage show that’s dance, music and theatrical performance blended into one electrifying rhythm. Feb. 9, 8 p.m. The Granada, 1214 State St. 805/899-2222, granadasb.org. Enjoy the magic of the holidays at The Granada Theatre’s Family Holiday Movie Weekend on Saturday, December 13 and Sunday, December 14! In addition to screening holiday movie favorites with the only 4K cinema projection system in the region, Santa Claus will make a special visit to The Granada Theatre to greet children, and there will be special seasonal musical performances by local school and musical groups including Montecito Union Elementary, La Colina Junior High, San Marcos High School, Santa Barbara High School and local public elementary school students from the Incredible Children’s Art Network (iCAN) program. noon to 1:30 p.m. Meet Santa Claus! 11 a.m. to noon Meet Santa Claus! General Admission tickets are just $5 and include open seating. Reserved seating in the Loge is available for $10 per ticket. Click here to purchase tickets for each music and movie performance, or by calling The Granada Theatre’s Box Office at 805/899-2222. The Granada is located at 1214 State St. Originally published in Santa Barbara Seasons on December 10, 2014.